A colorful and modern flat HTML5 bootstrap admin template for your next project. 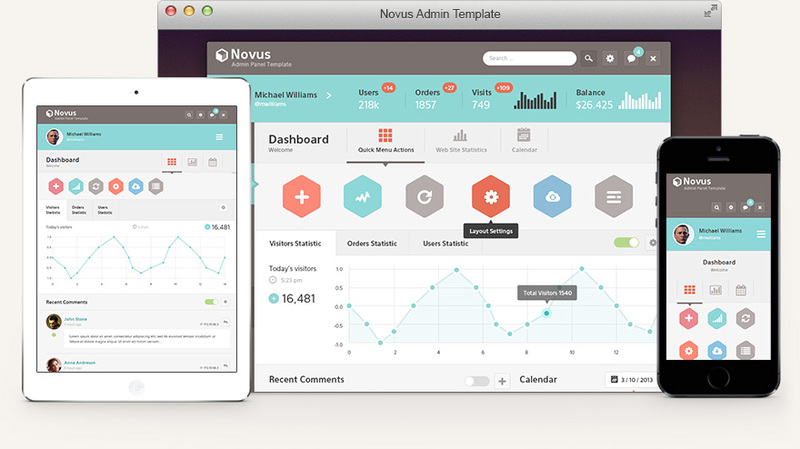 Novus is a very cheerful and striking admin panel template with a flat design style. You will find all the elements you might need to make your next admin dashboard project with ease. - Updated all libraries and components. - Code cleanup and fixes. The whole template has been crafted with responsive behavior. We have taken great care to make it the easiest to use and the best to look at in every resolution. No images were mistreated during the creation of this template. Every design element has been built through the use of the latest css3 techniques. We take great pride in translating our source files to the most faithfully coded and pixel-perfect result. Based on Bootstrap 3x & FA 4x. We decided to base our admin templates on the latest version of the popular front-end framework Bootstrap and include the Font Awesome vector icons’ font to make our templates very versatile in their use.